Heat Transfer, Combustion and Energy Systems and Micro and Nano Engineering: Thermal management of electronics, energy transport and conversion at the nanoscale, and applications of carbon nanotubes. Dr. Cola is currently focused on understanding and designing thermal transport and energy conversion in nanostructures and devices – particularly those based on carbon nanotubes or polymers. His group develops tools to characterize thermal transport across several orders of scale for this purpose. His research interests also include scalable fabrication of organic and organic-inorganic hybrid nanostructures for novel technological use. These technologies include thermal interface materials, thermo-electrochemical cells, optical rectenna, carbon nanotube metal composites, and materials that can be tuned to regulate the flow of heat. Dr. Cola's research involves theoretical and experimental components, and he seeks to solve problems with high importance to applications in clean energy (e.g., direct conversion) and the efficient utilization of energy (e.g., more efficient thermal management), and in major industrial segments such as consumer electronics, enterprise services (e.g., the cloud supporting infrastructure), transportation, and lighting. Current research directions include: high efficiency optical rectenna, extraordinary thermal transport by polaritons, thermally conductive polymers, thermo-electrochemical cells, and carbon nanotube metal composites. Students who work with Dr. Cola will build expertise that is firmly rooted in the physics of basic energy carriers, while integrating fundamentals from nearly all of the traditional disciplines of science and engineering to solve important problems. Many of our solutions are enabled by the unique and exciting science at the nanoscale. Students will have opportunities to participate in hands-on work (e.g., building new experiments or tools) and theoretical modeling; and learn to operate several tools used to synthesize and characterize nanomaterials. There are also opportunities to publish in journals, present at international conferences, patent technologies, and start new companies. 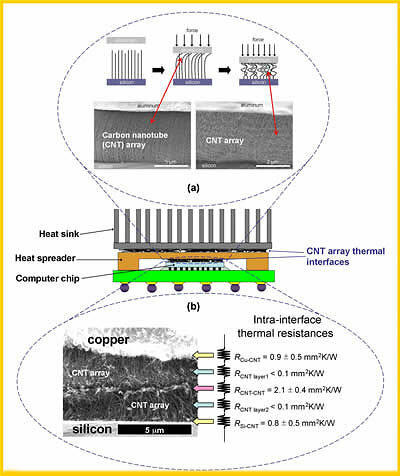 Caption: Carbon nanotube (CNT) arrays utilized for enhanced electronics cooling. (a) Highly compliant CNT arrays compressed in the interface between a representative computer chip and a heat sink. Such structures improve device performance and reliability by mitigating thermal stresses and enhancing heat removal. (b) Thermal resistances of a Velcro™-like interface with CNT arrays directly synthesized on both sides. Such interfaces produce lower resistances than bonded soldered joints. For more details see Cola et al., J. Appl. Phys. 101, 054313.